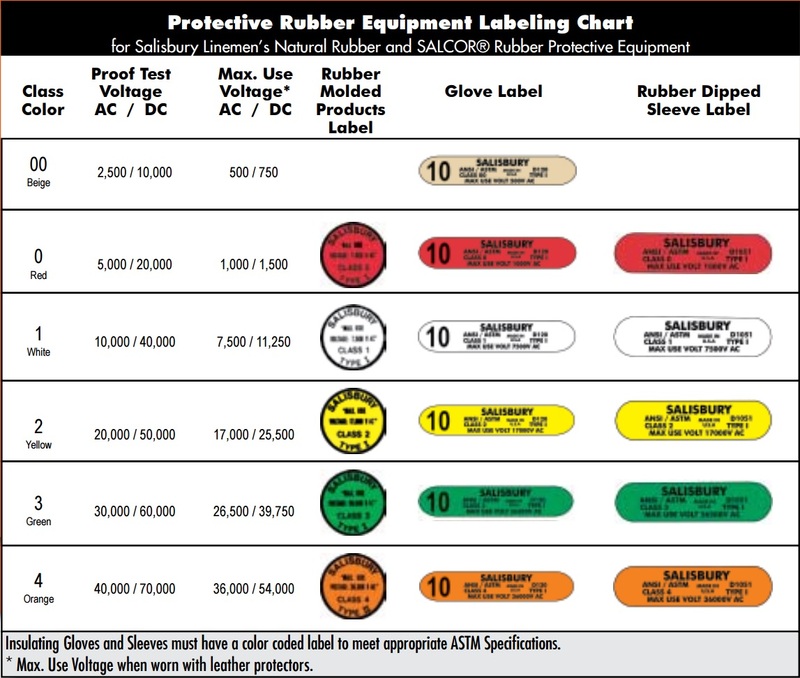 The 2015 NFPA 70E Standard states in 130.7(C)(7) that employees shall wear rubber insulating gloves and leather protectors when there is a danger of contact with energized electrical conductors or circuit parts. Rubber insulating gloves shall have the proper maximum use voltage rating for the exposure. The maximum use voltage is listed in the Salisbury “ASTM Labeling Chart”. Rubber insulating gloves shall be subject to periodic electrical test per OSHA 29CFR1910.137(c)(2)(viii) . Testing intervals shall be in accordance with Table I-5. Upon indication that insulating value is suspect and after repair. Before first issue and every 12 months thereafter; upon indication that insulating value is suspect; and after repair. Before first issue and every 6 months thereafter upon indication that insulating value is suspect; after repair; and after use without protectors. Voltage rated rubber gloves shall be given an air test, along with a visual inspection daily for damage that could affect the reliability of the rubber . Leather protectors must be worn external to the rubber glove and also must be inspected for conditions that could effect its protective properties. . NFPA 130.7(C)(10)(d)(1) states that a leather protector .07 mm in thickness, unlined will give a ATPV in acess of 10 cal/cm². Rubber insulating gloves are available in six ASTM defined voltage classes. Rubber insulating sleeves are available in Class 00 through 4. This chart identifies the class, proof test voltage and maximum allowable exposure voltage.